Keto OS NAT by Pruvit produces the most bioavailable ketone salts through the first and only naturally fermented process. 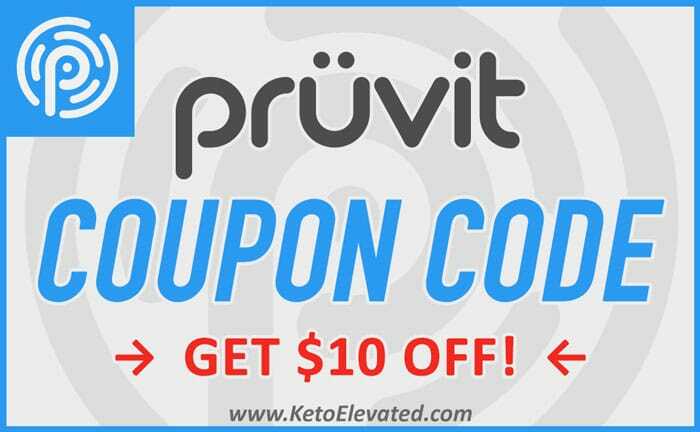 By using an all natural fermentation process, Pruvit has developed Keto OS NAT as the next generation in ketone technology which allows for maximum absorption into the human body. This natural process eliminates the need for unnecessary chemicals and product fillers. Through diligent research and testing, Pruvit has discovered a way to create bioidentical ketones using a patented natural fermentation process that mimics the way our bodies produce ketones while in a state of ketosis. Bioidentical ketones are ketones that are identical in molecular structure to the ketones that are naturally created by our body. These ketones are specifically known as BHB (beta hydroxybutyrate). The body responds to these lab created bioidentical ketones in the same manner as ketones that are produced in ketosis. The Keto NAT formula takes the bioidentical ketone process one step further by creating exogenous ketones through natural fermentation. The normal process for creating exogenous ketones requires combining multiple chemicals to achieve the final product. This process often leaves impurities that can work against the benefits of the product, and in some cases have a negative long term effect on your body. Note: No matter which method used, all of Pruvit’s keto products go through rigorous lab testing and DO NOT contain any impurities. The fermentation process to produce the ketones in KETO//OS NAT has no need for, and doesn’t involve, added chemicals. Only natural sources (patented) through fermentation to achieve the final product. What makes fermented ketones better for you? The elimination of preservatives and additives. No more chance of impure bi-product left over from the manufacturing process. Better cellular signaling throughout the body between ketones and how they are being utilized. People who may experience digestion issues, diarrhea, or nausea while taking ketones in the past, no longer feel the same GI disruption while taking naturally fermented ketones. This means no more incremental dosing to become adapted to ketones. Lab tests have shown a higher increase in blood ketone levels. Because the fermented bioidentical ketones are extremely well absorbed into the body. More natural flavor, and no more bad aftertaste. What Makes Keto OS NAT Better? KETO//OS NAT and its proprietary N8 Max NAT Blend with patent-pending KetoNAT BHB salts, facilitates quick absorption of ketones which allows a state of ketosis to be reached faster than ever, for unrivaled results. The unique C-Med 100 signalling blend supports and maintains healthy cell function, maximizes cell debris removal, and extends DNA telomere length for longevity, promoting rapid repair and recovery for the human body. With increased appetite suppression, KETO//OS NAT helps to burn fat by controlling your hunger and reducing your urge to snack. The N8 Max NAT Blend: KetoNAT™ (R-Beta Hydroxybutyrate, L-Taurine, Fermented L-Leucine, C-Med 100). Other Ingredients: Erythritol, Citric Acid, Natural Flavor, Rebaudioside A (Stevia Extract), Caffeine (Charged Version), Vitamin B6, Vitamin B12, Vegetable Juice Color, Xanthan Gum, Beta Carotene. Dairy-free, Gluten-free, Vegan, and Non-GMO. What is the price change for Max vs. NAT? Keto NAT will remain the same price as the MAX. The formula is essentially the same except for the new fermented ketone technology. I noticed that the Keto NAT flavors are same as the Keto Max. Is there any significant taste difference? 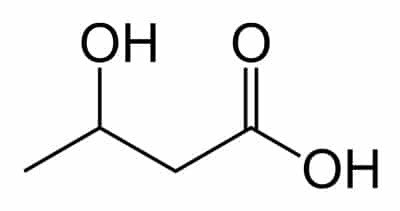 Because the Keto NAT ketones are made using a natural fermentation process, the need to mask the ketones with sweeteners and flavoring is much less. This eliminates any bad aftertaste that can come from drinking ketones that are bound to minerals like sodium. When will Keto NAT become available to purchase in the online store? 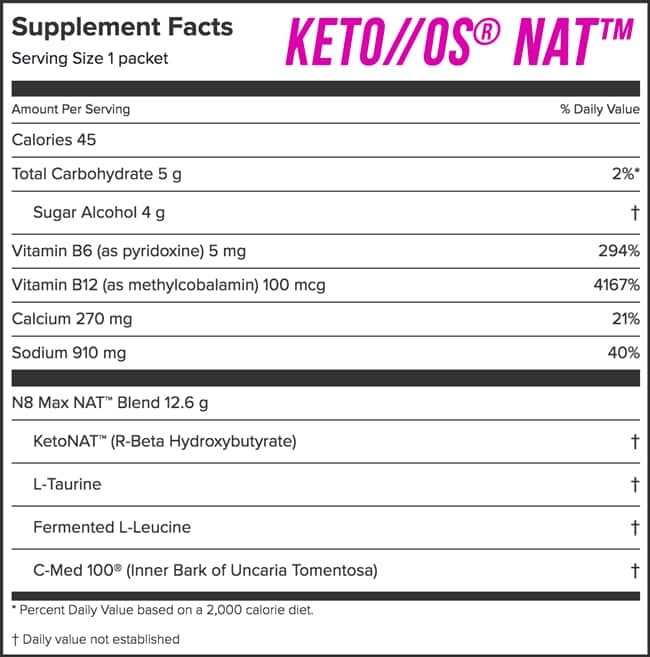 KETO//OS Max will eventually be phased out for the patented KetoNAT™ BHB formula and be rebranded as KETO//OS NAT. However, NAT is available to purchase online now in limited quantities via the Pruvit online store. 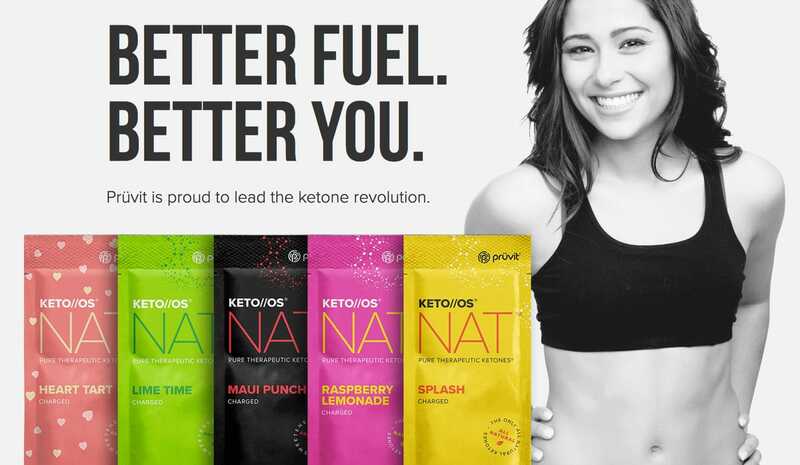 Pruvit is planning on adding the Keto NAT ketone formula to all of the products that contain exogenous ketones (KETO//KALM, BETTER//BROTH, KETO//OS UNLEASHED, ect). These products will retain their brands, and simply get the upgraded formula.